FILE - Russian Prime Minister Dmitry Medvedev during a Cabinet meeting in Moscow, Aug. 7, 2014. Russia's prime minister said Saturday that Russia’s military aim in Syria is to defend its national interests and defeat the Islamic State and not to keep President Bashar al-Assad in power. In an interview with the Rossiya TV channel, Dmitry Medvedev said that it is not important to Russia who leads Syria in the future, as long as it is not ISIS. “It should be a civilized and legitimate government,” he said. The Russian Defense Ministry said in a statement Saturday that the air force made 36 sorties in Syria, hitting 49 Islamic State targets in Hama, Idlib, Latakia, Damascus and Aleppo regions in the last 24 hours. Meanwhile, the Pentagon announced that military coalition forces carried out two air strikes against Islamic State targets in Syria, and 19 strikes in Iraq, coordinated with the Iraqi government. A video grab made on Oct. 12, 2015, shows an image taken from a footage made available on the Russian Defence Ministry's official website, purporting to show explosions after airstrikes carried out by Russian air force. Speaking to reporters Friday, U.S. President Barack Obama said that a ground offensive in Syria is "not going to work." Even though the Russians have come in and Iran is sending in more people, "it's also not going to work because they are trying to support a regime that in the eyes of the overwhelming majority of the Syrian people is not legitimate," Obama said. His comments came as the U.S. and Russia reached an agreement in principle to avoid each other's aircraft as both countries conduct air campaigns in Syria. Obama said that was the only issue the two countries agreed on since Russia began its contentious military campaign at the end of September. There has been "no meeting of the minds in terms of strategy," he said. Syrian troops on Friday morning began a military offensive in the province of Aleppo, the latest campaign to regain territory amid ongoing conflicts with both Islamic State militants and government opposition groups. Russian officials also said their airstrikes allowed the Syrian army "to go into assault across the whole country," Interfax news agency reported. Both Syrian and Russian news sources claim Syrian government troops reclaimed several towns in multiple provinces, including Latakia, Aleppo, Idlib, Hama, and Homs. Forces loyal to Syrian President Bashar al-Assad are fighting alongside Iran’s Revolutionary Guard Corps, Lebanon's Hezbollah fighters and Shi’ite militias from Iraq, Afghanistan and Pakistan in the Aleppo operation, and across the country. 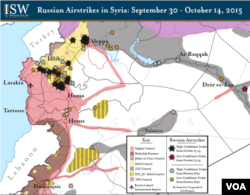 Russia joined the Syrian military coalition in late September. Moscow's daily airstrikes rankled other foreign forces carrying out air offensives against Islamic State militants and have become a repeated issue with Syria's northern neighbor, Turkey. The Turkish military on Friday said it shot down an aircraft of unknown nationality that had intruded into its airspace near the Syrian border. In a statement, Turkey's military said the plane ignored three warnings before Turkish warplanes shot down the aircraft Friday. An unnamed U.S. official told Reuters the U.S. believes the drone was a Russian aircraft, however the Russian defense ministry said all its planes in Syria had safely returned to base and all its drones were operating "as planned" after Turkish officials announced the shootdown. "All our drones are either in mission areas or at the airbase... Whose this downed drone is, you either guess or find out yourselves," Russian Armed Forces Col. Gen. Andrei Kartapolov said Friday, according to Interfax news agency. Turkey has in the past shot down Syrian jets and helicopters for violating Turkish airspace during Syria's four-and-a-half-year civil war. More recently, Turkey has complained about at least two instances of Russian warplanes violating its territory. Earlier this month, Turkish officials warned that Russian planes that cross the border into Turkey could be shot down. Ankara, which supports Syrian rebels, has strongly criticized Russia's military intervention. Moscow has blamed navigational error for some of the intrusions, but some Western officials have said the violations are deliberate. Also on Friday, a senior Russian military official said Russia’s air and land assets in Syria will be merged with its Soviet-era naval facility at Tartus to form a single Russian military base. He said the Russian naval group currently located in the Mediterranean Sea is mainly providing “material resources,” but is also being protected by “attack ships” that will also provide the Russian base with anti-aircraft defense. These air defenses, Kartapolov said, will not be used against the U.S.-led anti-ISIS coalition. He also said that all 26 cruise missiles fired from Russian ships at targets in Syria in the Caspian Sea earlier this month hit their targets, denying U.S. claims that four missiles had crashed in Iran. Separately, Kartapolov told journalists in Moscow in a briefing Friday that ISIS is increasingly demoralized and experiencing “mass” desertions.